get updated on new posts: join my newsletter and get new blog posts to your inbox. Based on the book "The Blue Ocean Strategy". I write a lot about getting employees invested, about efficiency, improved service, measuring indicators, and precision work with employees and clients. But if, at the same time, you have to lower prices in order to preserve clients in a competitive market, and to supply custom products to every client – you might find yourselves running fast in order to stand still. There's a danger that increased profit as a result of improvements in production will disappear compared to competition in the market, and at best you'll maintain low profit margins. What are the Blue Ocean and the Red Ocean? Red Oceans are all the markets which already exist. Blue Oceans are all those which don't exist yet - the unknown market. In Red Oceans you constantly compete with other companies to reach more clients, or at least not lose existing ones. Over time, more competitors emerge, who offer the same product or service as you for lower and lower prices, and the market becomes crowded. Relentless competition turns the Red Ocean bloody. In Blue Oceans competition is meaningless, because market rules have yet to become set. Is a Blue Ocean Possible for You? Blue Oceans are opportunities for very profitable growth. And a moment before you click out of the article, thinking that "in this life" a Blue Ocean isn't possible for you, I invite you to rethink. It doesn’t matter if you're in food, plastics, metals, or provide computer services, I assume your company was once profitable. Over time, market conditions changed, and if you weren’t able to change faster than them, you're probably now struggling to survive. The only thing I recommend you keep from the past is the memory that you used to have something good which generated good profits. And just as in the past your company could offer something special, so you can do now and in the future. I chose to focus in this article on a strategy of advancing beyond current demand. In the book, this strategy is discussed in chapter 5. I believe it’s a viable and practical way for everyone. It sometimes requires thought and investigation, and I recommend you have brainstorming sessions which involve as large a forum as possible. As you think and take actions to increase demand, you'll enter a Blue Ocean. Profs. Kim and Mauborgne recommend a change to two common work strategies: the first, focusing on existing clients. The second, a tendency to narrowly segment the market in order to answer client preferences. The more companies compete through targeting specialized market segments, the more they risk creating too-small target markets. Instead of focusing on the company's existing clients, the authors suggest you first consider non-clients, as well as concentrating on similarities between clients instead of on differences, in order to limit segmentation. Thirty years ago, when I was the CEO of Shamir Optical Industry, we developed the knowledge and ability to manufacture multifocal lenses. At the time, few companies in the world knew how to do so, maybe three or four very large ones. The giants which controlled the global market. It will take fifteen more years for "Blue Ocean Strategy" to be published. But at the time we created a Blue Ocean, before Kim and Mauborgne coined the term. Our knowledge and abilities brought us to a Blue Ocean. But we were a very small company, even miniscule in terms of the global market. We had no chance to reach the final consumer, who would have purchased lenses from one of the global giants. We identified our non-clients as the large and medium companies (globally speaking) who didn’t know how to manufacture multifocal lenses. Since this was the "hot" product, they greatly wanted to be able to. Once we defined our future clients, a chance for us to revolutionize our market, we used our knowledge to develop a product and a marketing strategy which didn’t exist before. We developed a computerized tool and an ability to customize lenses for each company. Seemingly, we segmented our market. That is, every company got a slightly different lens-design, but the process of customization was relatively simple, while clients payed a large premium for it. Customization was itself a source of profit. The product we developed allowed us to reach our non-clients and answered the fundamental similarity point. If before developing this product, medium-small companies ignored us or hung up the phone before we finished the first sentence, afterwards we became the market darlings and many doors were opened to us. I estimate that for a lot of companies, the past holds a similar kernel of success. The goal today is to return to it. 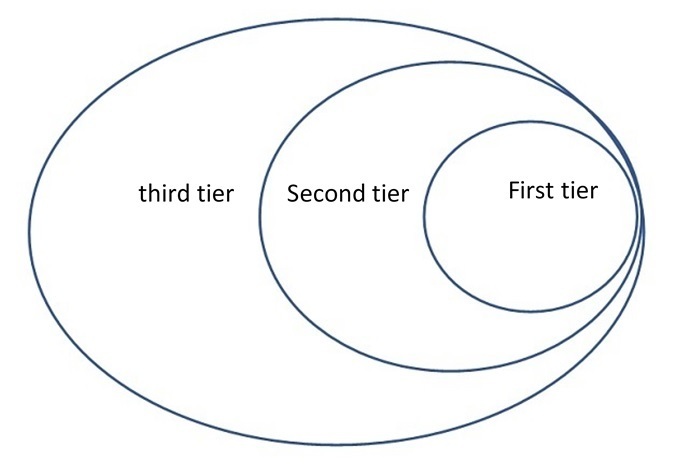 Let's now look at the three tiers of non-clients, as presented by Kim and Mauborgne. The first tier of non-clients is the one closest to your market. These buyers sit at the edge of the market. They purchase very small amounts of the products, out of necessity. But mentally, they aren’t part of the market segment. The second tier includes those who refuse to use the products. They see them as a possible answer to their needs, but choose not to use them. These are "objector" clients. They don’t use, or can't afford to use, current market offerings. This tier holds an ocean of untapped demand waiting to be turned into clients. The third tier of non-client is furthest from your market segment. These non-clients never considered using your service or product. Usually no company in your field looked at them. The reason for this is that their needs, and the business opportunities they represent, were always considered as belonging to another field. This tier also holds great untapped potential. Kim and Mauborgne include in their book an example for turning second tier non-clients into clients. JCDecaux is a French company supplying outdoor advertising spaces. Until 1964, such spaces were only available on roadside billboards, or on cars. In both cases people would see the advertisement for a short moment. For that reason, large companies tended not to use either method. JCDecaux realized that a paucity of stationary spaces was the reason the field remained small and unpopular. They started to supply municipalities with street furniture (benches, sheds, fences, etc.) for free, including a guarantee they'll maintain and fix them. In exchange they got exclusive rights to use them as advertisement spaces for eight to twenty-five years. In response, hordes of "objector" non-clients flocked to them. How to Create the Change with Non-Clients? As a first step, prepare a list of all non-clients, who do not purchase from you, or from anyone in the field. In order to include companies that don't buy from you nor from your competitors – you'll need a considerable degree of creativity. Because if a company doesn't purchase the kind of products you manufacture at all, how can you know they might be interested in them? To generate the required creativity, the best way is to gather a large and especially diverse forum of employees and managers, and brainstorm. Remember – if those gathered are similar and close to you in their role or level in the company, there's much less chance of groundbreaking thinking. For a second step, after you've compiled a list on non-clients, try to find the similarities in their needs (that is, what's similar and what's different in each company's needs). Since directly asking non-clients won't always get you an answer, it's best to hire an outside company, or some students, to ask for you. The third step is the creative part. Build a value proposition which will answer the shared need of as many non-clients. Here too you'll need creativity, and the way to get it is the same as in step one. As a rule of thumb, I recommend you divide any complex and even a little impossible task, into sections, into small steps. Small steps are simpler. Here I divided the process into three steps, which are much simpler and more practical than the task seemed, perhaps, beforehand. The second tool is working in diverse teams. Diverse in terms of ethnicity, age, roles in the company, and of course gender. Don’t be tempted to only sit with those who are closest to you. Small and homogenous teams have a lower chance of creative and innovative thinking. This article is based on the book by Profs. W. Chan Kim and Renee Mauborgne. I believe that companies that have existed for many years used to operate in a kind of Blue Ocean. In the past, the Israeli market was static. Import was limited and few companies competed. Both manufacturers and importers had unwritten agreements not to get in each other's way. Once we add customs-taxes and other measures to curtail imports, we get a market with little competition – or in other words, few Red Oceans. The result was that Israeli consumers payed a high price, for a not-so-high quality. As global commerce improved, and many entrepreneurs began importing products, competition increased. The profitability of many companies decrease or disappeared. One way to deal with disappearing profitability is to move to the manufacturing and sale of products which are in a Blue Ocean. Even though it seems near impossible to develop products (or services) in a Blue Ocean – it is possible, and even crucial. I presented above the methods and tools I recommend. If you are interested in my professional help, personally or for your company, the best way is to send a request through the Get in Touch form in my website (here). CEO & Founder of Business Excellence. Has extensive experience managing companies and business units in Israel and the world, and founding start-ups. My unique specialty is increasing net profit in companies and leading systematic changing in operations and management in companies facing bankruptcy, bringing them to profit. Contact me on zeev.ronen@business-excellence.co.il or on +972-524-767531. Who Should Leave the Comfort-Zone, Employees or Management – or – How to Get Employees Invested? Why It's Important to Define and Advertise Your Organizational Structure? Teamwork – How important is it and how do you create it? How Does the Working Environment Effect Human Potential? 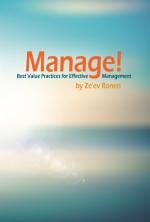 Twelve principles of effective management - The first chapter from my first book: "Manage! Best Value Practices for Effective Management"
How do you maintain 5S over the years? 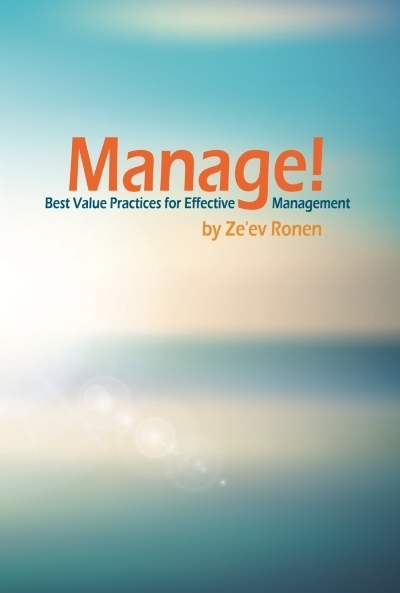 Read the first book by Ze'ev Ronen: "manage!" provide a fresh look on how you can improve business results by making your company matter to your employees. The book brings together a set of tools that every CEO should know, presenting them in a clear, concise and consistent fashion that will leave the reader with comprehensive and useful knowledge to assist them in their careers as managers. Leading improvement in factories and business, in a unique work method which combines advanced KPIs implementation and Improvement Teams containig employees from all levels. Besides the increas in profits, a successfull project we do will also improve the employees motivation and connection to the company's goals. Get my orinigal professional artciles for Managers of all levels. NO SPAM - I respect your privacy and time.